One block from Chesapeake Bay in a well-maintained aquamarine-roofed mini mall, PLEASURE HOUSE BREWING began operations in 2014. Prolific homebrewer, Drew Stephenson, crafts rangy fare running the gamut from simple blonde ale to wattelseed-laden stout. My wife and I grab seats at the bar where a pastoral earth-toned brick wall features twelve tap handles. Wall-hung surfboards and mounted fish decorate the place and show off Pleasure House’s amiable beach spirit. The cement -floored space offers one community table and eight dining tables while several brewtanks hide behind the bar. Crowlers and cans are available for takeout. Musky wet graining soaked spritzy lemon limed souring for light-bodied G’Suffa Helles Lager, leaving minor herbal spiced restraint upon the crisp finish. Tingly Belgian-styled lightweight, Shuckers Single Blonde Ale, plied orange-peeled lemon meringue piquancy to honey-spiced pilsner malts and salty herbal notions. Salted yellow grapefruit piquancy led the way for Glo Belgian Blonde Ale, picking up mild lemon, orange, banana and mango tropicalia. Blackcurrant tartness boosted hybridized German wheat beer, Melo Currants Hefeweizen, shoving stylistic banana-clove sweetness to the side for currant-bound honey mead wining. Easygoing NoMoHazeBros Brut IPA (with Simcoe-Amarillo hops) let sparkling Brut champagne effervescence pick up light wood tones to envelop lemony orange-tangerine-grapefruit tanginess. Duck sauce-like Duckin Saison boasted apricot and ginger adjuncts that serenaded black-peppered green grape wining and mild dry leathering. Approachably smooth Chardonnay-barreled Light Tower Wine Aged Saison brought light white wine tannins to sour lemon rot and dry barnyard acridity. Hop-forward Red Mill Seven Red Ale let sharp red-orange fruiting gain caramel-spiced grain toasting. Lemony orange, grapefruit, peach, pineapple and tangerine tanginess brightened Rudee Inlet Imperial IPA, a lightly creamed medium body with delicate pale malt sugaring. Roasted wattle seed boosted OB’s Wattleseed Stout – Nitro, scurrying thru bittersweet cocoa-dried black chocolate malting, peanut-oiled walnut musk and mild hop-charred bittering. Two entrepreneurial Virginia Tech grads, Aaron and Christine Holley, decided to showcase “German Style Brewing with a Beach Kick” and in 2015 started a water dog-named brewery for all the local denizens. On the outskirts of Virginia Beach, WASSERHUND BREWING COMPANY crafts some outstanding homemade Bavarian draught fare to go alongside damn fine artisan pizza and German meats. A central bar services several wood-metal tables and four outdoor patios beneath an aluminum overhang. Surfboards decorate the ceiling alongside Edison lights while a huge blackboard displays tapped beer list. My wife and I shared Puggle Pizza (white-sauced feta cheese with bacon, onions and mushrooms) while hanging out, ironically, with our puggle, Roscoe, mid-July 2018. Mild PureBred Pilsner, a German-styled light body, coalesced grassy-hopped pilsner malting with corn-sugared sweetness and tingly spicing. A Helles lager with Czech pilsner tendencies, Schutzhund Lager retained dry-hopped herbal pungency, wet-grained dankness and lemon-soured spritz. Kettle-soured Salty Dog Gose let ground coriander serenade raw-honeyed lager yeast, whereas sharply tart pink-hued Raspberry Salty Dog Gose brought lemony raspberry souring to salt-licked coriander spicing. Black tea-like Belgian blonde hybrid, German TEArrier, gained dried plum tones and delicate hop spicing. Soft-toned German Shepheweizen retained lightly creamed vanilla sweetness and distant banana-bubblegum sugaring, leaving wispy herbal nuances in its wake. Orange blossom-honeyed Summer Fetch Citrus Honey Wheat picked up herbal lemongrass reminders for lemonade-sugared pale wheat malts. Nifty hop-forward Doggy Paddled IPA, a medium-bodied West Coast version, allowed mild grapefruit and navel orange tang to pick up light lemon souring for contrast against sweet honeyed pale malts. Breakfast-styled Haywire Husky Coffee Pale Lager offered milk-creamed coffee pleasantries to pale malt dryness in an understated manner. Casual nightcap, Bitchin’ Bacon Stout, draped mild bacon-smoked fattiness upon chocolate-milked cocoa fudging and peanut-charred whims. 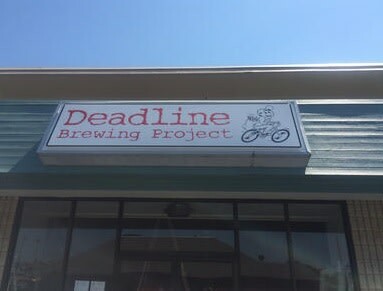 In a humble mid-space at the Seashore Shops in Virginia Beach, DEADLINE BREWING PROJECT began slinging suds September 2017. Diligent head brewer, Darrell Cuenca, crafts rangy small-batch elixirs that tickle his fancy. Currently utilizing plastic fermentation tanks as of my first visit, July ’18, Cuenca’s crisply clean fare matches the pristine surroundings of its nuevo modern Industrial white-leathered chairs and inviting living room comfort. Deadline’s L-shaped 15-seat bar includes six taps and a refrigeration unit. A right side community table fills up with noon time patrons. Exquisite quotes from scribes Hunter S. Thompson and Thomas Wolf are painted on the left wall alongside quips from respected newsmen Edward R. Morrow, Dan Rather, Tom Brokaw and Peter Jennings. Stylishly robust Pacer Blonde Ale placed desiccated orange spicing and mellow passionfruit tartness across hard wood tones, finishing light with dry pilsner-malted spelt and oats graining. Dryly coniferous medium-bodied IPA allowed crystalline-watered crisping to truly capture the tangy pineapple-mango-tangerine subtleties and hard-candied lemondrop sugaring overriding the sweet pale malt setting. A unique hybridized collaboration with local brewers’ Wasserhund, Back Bay, Home Republic and Gordon Biersch, Erd Beer IPA brought yogurt-soured lactose and tart strawberry to the fore as lemon-limed bittering gained influence alongside Hallertau Blanc-hopped green grape esters. Zesty Calamondin lime brightened Amelita Calamansi Shandy, and orange-pineapple-candied soda alternative bettering most of its gimmicky summertime competition. Occupying an inconspicuous warehouse with green and white awnings and a hop-driven surfboard logo, BEACH BREWING COMPANY has gained a tremendous reputation since opening for business in October ’11. During a muggy July ’13 Saturday afternoon visitation, the front of the place was filled to the gills with young families, post-collegiate brewhounds and several thirsty out-of-town beachcombers enjoying well-rounded beers and BBQ pit food. My wife and kids enjoy barbecue chicken and pork while I go inside the tiny 4-stool tasting room to procure four previously untried brews. Grabbing a seat along the right side nautical-postered wall at one of the front chairs, I place my sampler tray on the elbow-high shelving and begin to watch a ballgame on the left wall TV while reading beer descriptions from the blackboard Tap List. A labor of love for married co-owners Justin and Kristin MacDonald, Beach Brewing’s libations are presently kegged for retail and served at several local restaurants. However, room for expansion behind the taproom is in the cards. Though flagship beers Hammerhead IPA and Hoptopus Double IPA are both out upon my initial sojourn, four other distinct offerings make the rounds. Approachable summer session opener Sandshark Summer Ale brought soft-watered orange, grapefruit, apple and apricot fruiting to a mild hop-spiced slipstream. Equally buoyant, Riptide Altbier left Noble-hopped wood dryness along its caramelized fig-sugared plum and date pathway. Perhaps a step removed from the specified German-styled realm, the pliable moderation nonetherless suits many occasions. Better still, tropical The Kracken Triple IPA allowed subtle orange-peeled grapefruit bittering and perky lemon-seeded tartness to infiltrate juicy mango, kiwi, pineapple and passion fruit illusions as well as buttery caramel-malted red apple, grape and cherry undertones, leaving a lingered alcohol burn in its wake. For dessert, brandy barrel-aged dark ale, Devil’s Take Imperial Stout, worked hop-charred dark chocolate, roasted coffee and cocoa into rye-malted toasted oats, picking up brandy-wined sherry and port boozing. By the mocha finish, Jameson dark whiskey snips reach the surface. 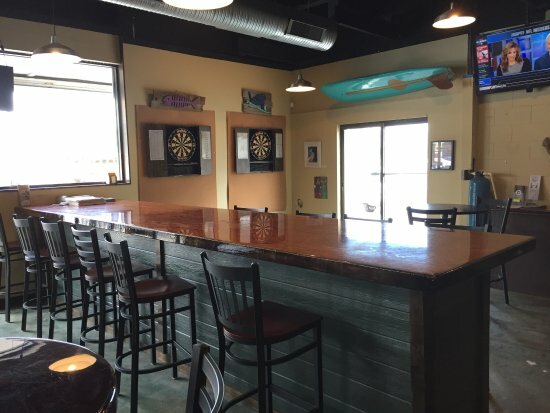 Just a few miles from the hotel-bound Virginia Beach boardwalk, Beach Brewing will impress a goodly number of respectable sun-tanned beer travelers. As a pleasant sidebar, military-themed microbrewery Veterans Brewing was getting ready to open within walking distance.